Tri-Village’s Derek Eyer cuts to the rim through the Tri-County North defense during their Cross County Conference game on Friday night. The Panthers won the game, 73-66. Tri-Village’s Gage Hileman tries to get a round a Tri-County North defender during their Cross County Conference game on Friday night. The Panthers won the game, 73-66. Tri-Village’s Layne Sarver goes to the hoop for a score during a Cross County Conference game with Tri-County North on Friday night. The Panthers won the game, 73-66. 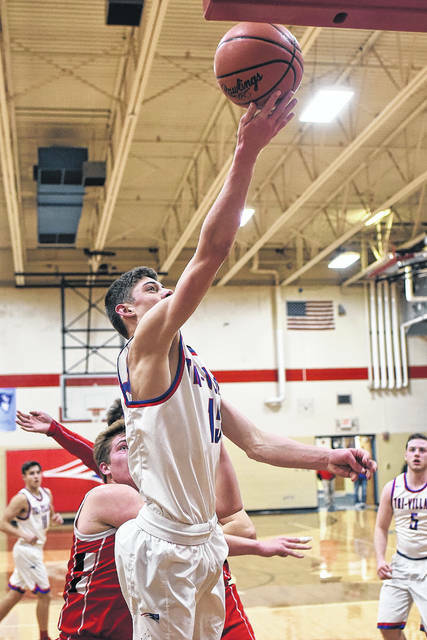 Tri-Village’s Mason Lay puts up a shot from inside the paint in a Cross County Conference game against Tri-County North on Friday night. The Panthers won the game, 73-66. 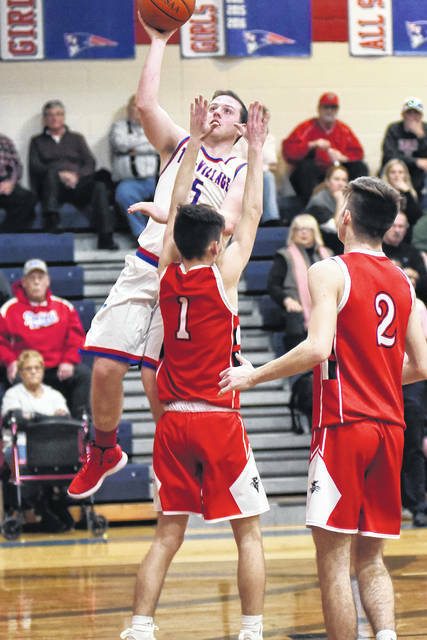 Tri-Village’s Mason Sullenbarger hits a layup against Tri-County North in their Cross County Conference game on Friday night. The Panthers won the game, 73-66. 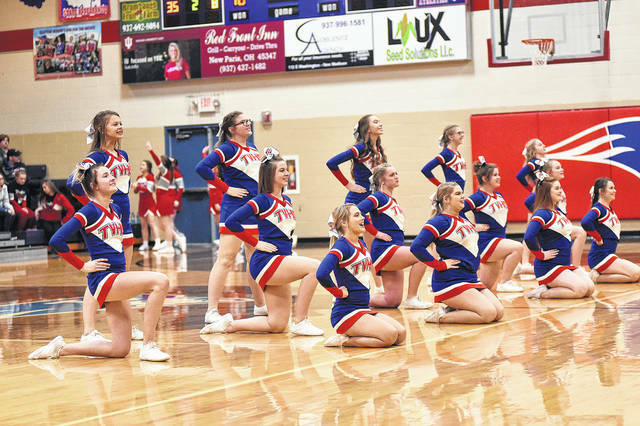 The Tri-Village varsity cheerleaders perform for the home crowd during a break in action of the Patriots home game with Tri-County North on Friday night. The Panthers won the game, 73-66. Tri-Village’s Austin Bruner throws up a behind-the-back hook shot underneath the basket during a Cross County Conference game with Tri-County North on Friday night. The Panthers won the game, 73-66. 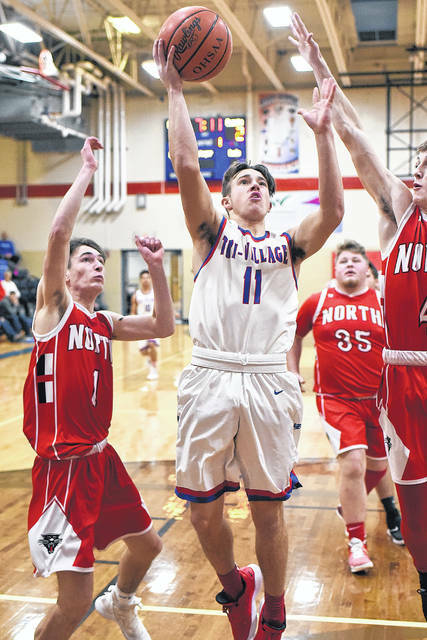 NEW MADISON – Tri-Village came up short in its match-up with Tri-County North falling 73-66 in Cross County Conference basketball Friday night. There was plenty of offense to go around as both teams knocked down nine 3-pointers each in the contest. 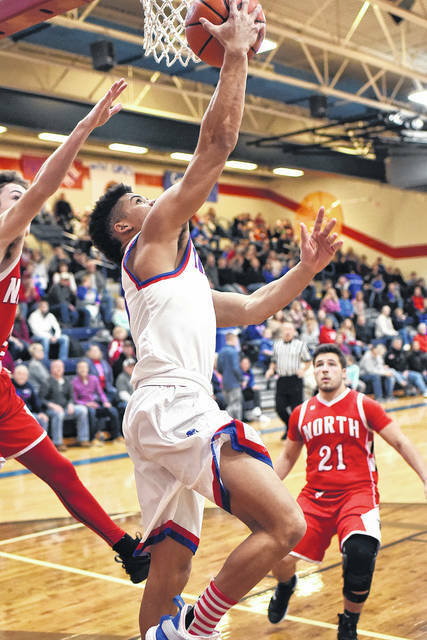 In the end a few more easy baskets inside was the difference as North’s big man Preston Jackson scored 12 points mostly in the second half to keep the Patriots from coming all the way back. Tri-Village trailed 16-10 at the end of the first quarter and trailed by as many as 14 points a couple of times in the game. Every time the Patriots made a run to get within four points, North answered with a long-range three ball and the dance would continue multiple times throughout the night. 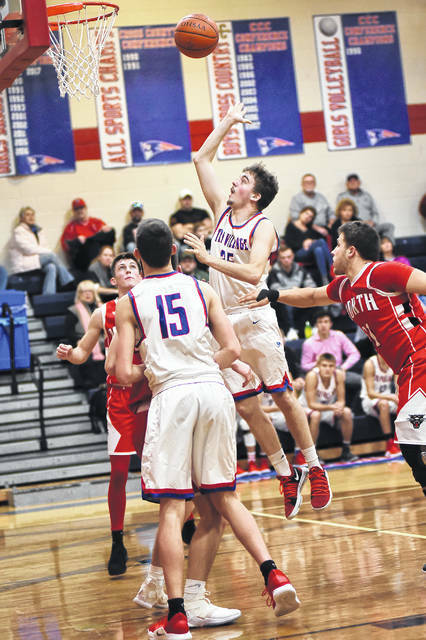 The Patriots trailed 32-22 when Mason Lay hit a triple to end the first half and then Gage Hileman hit a triple to start the second half and the Patriots had closed the gap to 32-28. North answered with a triple by senior Brian Stinson, who had a big third quarter scoring 13 of his game high 25 points. A few inside buckets by Jackson put the Panthers back up 45-33. The Patriots closed the quarter strong with triples from Hileman, Derek Eyer and Layne Sarver to cut the lead back to 5, trailing 51-46 heading into the final stanza. Once again, North opened up a large lead this time reaching 14 points (69-55) with 1:15 to go when Hileman hit a triple, then Eyer added one and a Mason Sullenbarger runner in the lane helped the home team make another run at North, but the clock would run out with Tri-County North taking the 73-66 win. “The game was simple, who can play better defense and slow the other team down. We didn’t do a good job of containing them and they did a really good job of finding the open guy. We would cut it to four and they would make a cut here a jab there and make a three and it was like that the whole night. It was frustrating, but you have to give them credit they did what they were supposed to do, they executed, and I’ve got to give them credit for that,” Tri-Village coach Mackenzie Perry said. Tri-County North was led by Brian Stinson with 25 points, Dylan Stinson 16, Preston Lairson 12 and Preston Jackson 12 to place four players in double figures. North improved to 5-9 overall and 4-4 in the Cross County Conference. 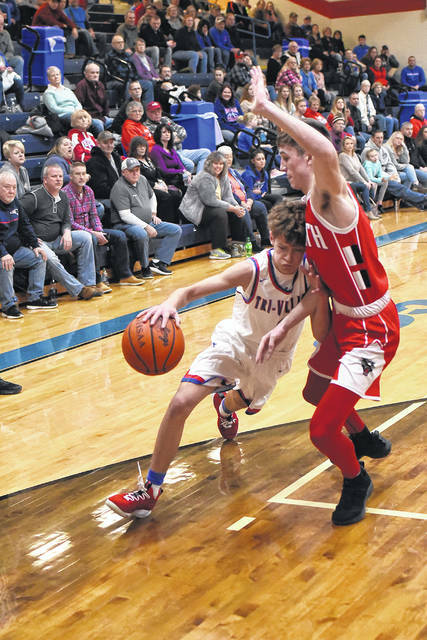 Tri-Village was led by Gage Hileman with 18 points, Derek Eyer had 16, Layne Sarver 12 and Mason Lay 10 to match the Panthers with four players in double figures. Tri-Village falls to 6-8 overall and 3-5 in conference play. Perry was complimentary of a couple players off the bench with both Eyer and Bruner picking up two early fouls and sitting the bench for a while. “Mason Lay has been earning minutes in practice and chomping at the bit for time and he got rewarded and did a great job today scoring 10 points off the bench and had a heck of game. Mason Coby also did a good job off the bench filling his role as well,” Perry stated. “We just have to be better defensively. We are so close to putting together a complete game, but just can’t quite get there, but we will,” Perry concluded. Tri-County North – Lairson 12, D. Stinson 16, B. Stinson 25, Lockwood 6, Jackson 12, Moore 3. Totals 9-16-14/22 – 73. Tri-Village – Hileman 18, Eyer 16, Sarver 12, Lay 10, Sullenbarger 6, Bruner 4. Totals 9-13-13/18 – 66. 3-pointers – Tri-County North 9 (Larson 4, B. Stinson 3, Lockwood 1, Moore 1), Tri-Village 9 (Hileman 4, Eyer 2, Lay 2, Sarver 1). Records: Tri-County North (5-9, 4-4 CCC), Tri-Village (6-8, 3-5 CCC).